Most springs, it’s the bright yellow of the forsythia that make me excited about gardening again. 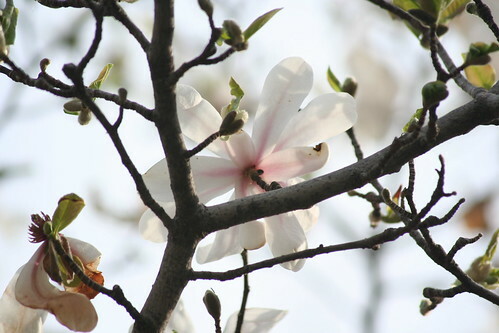 But this year, the magnolias are doing the job. They are just stunning, partly because I never remember where they are in the neighborhood, until they bloom. The tiny young ones are the best- why is it surprising that a 3-foot tall one blooms just as much (in proportion) as a 30-foot tall one? The lanky, lazy blooms, from afar, always make me think of the little tissue ghosts that people hang from trees, around Hallowe’en.